In the U.S., the online classifieds space has been dominated for years by Craigslist, despite its failure to adapt to newer technologies, including mobile. That has left room for newcomers to angle their way into the market, including big companies like Facebook, with its local selling groups, as well as smaller startups, like top-ranked shopping apps OfferUp and letgo. Ebay has also been quietly growing its own local selling marketplace amid this competition, and says today that its Close5 app has been downloaded more than 7 million times to date. That’s up from just 250,000 users as of June of last year, indicating the massive room for growth in the mobile, local selling arena. Ebay hasn’t formally discussed its plans with Close5 until now, having instead focused on building the app’s community and wrangling strategic partnerships, like a newer one with a startup called Lugg, which allows users to arrange to have items transported across town in an Uber-like fashion. While eBay is best known for its online marketplace for buying and selling, it also runs local classified businesses in 17 markets worldwide, featuring a dozen brands. This makes it the largest classifieds company in the world. Today it has classified apps in countries like The Netherlands, Germany, the U.K., Denmark, Singapore, Australia, South Africa, Canada and elsewhere. In 10 of its markets, eBay’s classifieds app is considered the market leader, and its apps are often No. 1 in the local App Store. Combined, the classified services group at eBay generated more than $700 million in revenue in 2015, according to eBay’s earnings — that makes it a significant business at the company, and also one where eBay has a lot of experience it can pull from now that it’s aiming to repeat its success in the U.S.
That said, the U.S. market is far more competitive, and unseating Craigslist has proven to be a difficult feat. Still, eBay believes that Craigslist’s lack of a solid mobile strategy leaves room for new competition. However, eBay isn’t just focused on making local selling mobile-friendly. It’s also rethinking everything about how classifieds should operate on mobile, from the visual layout to user privacy to transactions and more. For starters, Close5 is designed to be a highly visual app. The company wants users to launch the app when they have time to kill. That would make it different from standard e-commerce sites, which consumers visit with a specific goal in mind. Instead, the idea is to offer a somewhat Pinterest-like “inspirational” browsing experience. The app also addresses a few areas where Craigslist has fallen short, including speed, user privacy, managing transactions, transportation of larger items and more. Thanks to eBay’s knowledge of building marketplaces, Close5 is designed to be fast for sellers to list. Within 3 seconds you can post an item for sale either within your own neighborhood or as far out as 50 miles. Close5 also lets users communicate privately rather than sharing phone numbers, emails or addresses. Buyers and sellers can simply agree to meet at a public location to make an exchange. Today, Close5 isn’t facilitating transactions within the application, so any estimates of sales volume are difficult at this time. However, the company is actively working on this feature, among others. An upcoming version of Close5 will help users pick nearby spots to meet by suggesting meetup places like local coffee shops or malls. Another feature will offer calendar integration in order to suggest available times to meet. Ebay is also experimenting with adding different services that can help make transactions smoother. One such test is the Lugg integration, noted above. “We’ve integrated Lugg with some of our items…if you buy a couch and you don’t have a big car, you need someone to help you,” Cakir explains. “[We are] seeing if users adopt this…it’s a small test,” he notes. Other tests are underway as well, but eBay isn’t prepared to discuss these, he Cakir adds. EBay clearly has the background and resources to develop a local selling service for the U.S. — its “small team” working on Close5 is 100 people strong, one-third of whom focus on customer service. However, it won’t necessarily be the one that wins on mobile. Today, letgo is the No. 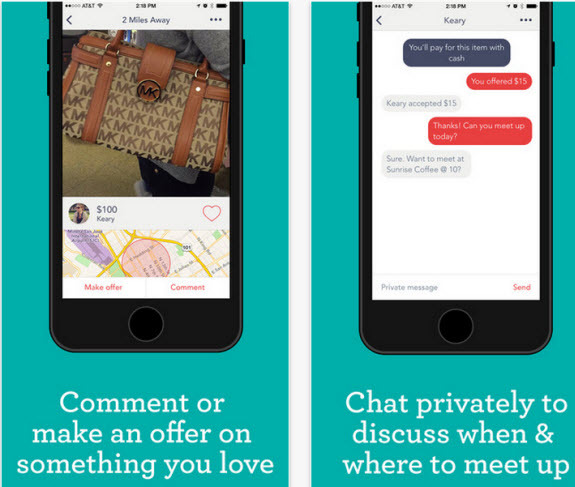 2 Shopping app (free) on Apple’s App Store and rival OfferUp is No. 3. Ebay, meanwhile, lists Close5 in the less competitive “Lifestyle” category, where it’s No. 4 (free). That makes it difficult to compare directly, but it’s worth noting that Close5 is ranked No. 223 overall, while letgo is No. 46 and OfferUp is No. 49. Plus, Facebook has millions of groups on its site, and has said before that sale groups are the most popular category. EBay declined to discuss active users numbers for Close5 today, but Cakir ball-parked its traction relative to the company’s other properties. “When we compare our Close5 user engagement with our other classifieds businesses around the world — even though we’re in the early stages — the engagement of the users is as high as the mature markets. So it’s really positive,” he says. Close5 is a free download for iOS and Android.